I'm a big organiser. I very much like configuring specific belongings and making sure that they're organised to maximum potential. This means I reorganise; a lot! Clothes storage, Alexander's toys, the under stairs cupboard, the kitchen cupboards, and most importantly, my book collection. Reorganising my bookshelves is a regular thought of mine; I have a burst of inspiration and feel like switching things up. It wasn't actually that long ago that I gave a books a shuffle around last, however with this newest shift I had a purpose, and a genuine thought process. We recently acquired another bookshelf, that sits on our landing / upstairs hallway area, and on that are books of mine as well as Alexander's. Now not all of my son's books are on this shelf, but he has the lower shelf for books we don't read as often (most read books are easily accessible in the living room), and the top two shelves were for my books. The plan I had in mind was to make this bookcase more child oriented, and what I mean by that is put my middle grade and young adult books on there, as opposed to the books that were already there. The MG and YA books that I keep are for me to revisit, of course, but also will one day be Alexander's... When he is much older. This seemed like a practical reorganisation. The top shelf within this unit houses my favourite reads as well as a number of collections I have yet to complete. By collection, I mean a series or author whose books I'm acquiring in their entirety. The second shelf houses my classics and miscellaneous fiction titles. And as I mentioned above, the last shelf is where we store some of Alexander's books. This collage is a bit of an eye boggler to begin with as it kind of looks like the same picture twice, but it is in fact three. The first picture is a full length shot of my bedroom book case. The second picture in the upper right corner shows my top four cubby holes - the ones typically seen on my 'Currently Reading' posts in the background. The first holds my unread books with the next one over housing my Cecelia Ahern collection. 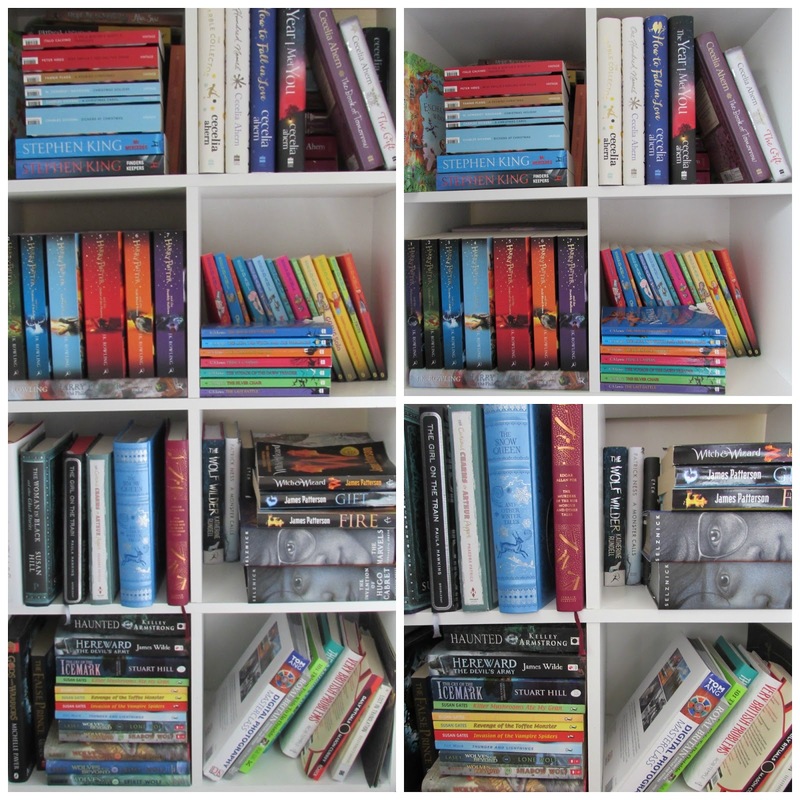 The third cubby is strictly Harry Potter, and the fourth, which usually looks neater, is my Dahl collection and Narnia series. The bottom right picture shows my bottom four cubby holes - the ones you typically don't see; they definitely aren't pretty or colourful like the first four! The first cubby is an assortment of random hardback books, the second is MG or YA reads, the first on the lower shelf is Nathan's cubby (in case you didn't know, Nathan is my partner, and reads e-books mostly) and the last is where I keep non fiction titles. So after pulling all the books off of both shelves, dusting down the books as well the shelves themselves, I got on with the fun part - organising! On the landing bookcase I only worked on the top two shelves, leaving the bottom shelf exactly as is - although I did dust it. Working our way upwards, we have the shelf which now holds any Harry Potter related books, as well as my Roald Dahl collection and the Chronicles of Narnia. The side of the shelf holding the HP books also includes the box case in which my set came in, however since reading the books they no longer fit back in the case itself so I've just tucked in behind the collection. Note: I have moved the top shelf up a level in order to fit my illustrated HP and Artifact Vault standing up. Top shelf here holds random MG and YA titles. My children's classics are on there, as well as my budding Emma Carroll collection, two beautiful books by Brian Selznick, and a few more titles. Another eye boggler - three pictures in the same format again. The first picture being an overview shot of the shelves as a whole. The upper right picture details my first four cubby holes, and once again I needed to keep them photo friendly as they are the backdrop for some of my posts. The first cubby hole holds an assortment of random fiction titles, including some of my favourites that you can't see behind the front stack there. The space beside the white book is for another white book (they are Roald Dahl's short story collections) but at the time of reorganising and photographing, that was downstairs. My Cecelia Ahern collection remains in the same place, however I've just switched the books around a little with the paperbacks in the front now as opposed to the hardbacks. The third cubby is a bunch of random books, again, but I wanted to keep a grey and white theme as I liked the look. Of course that one red title had to spoil it a bit! The last of the upper four shelves is for a few collections I'm collecting, but with black spines running along the front. The lower right picture shows a brief overview of the last four cubby holes. You may be able to tell, but I haven't touched the bottom two shelves, other than for dusting and to tidy; the books on them remain the same. The shelf with just the two random books is pretty much free space, and the first of the four cubby holes is where my unread books now currently reside. There are two layers in there, as with most of the cubby holes. That's one of the things I like about both of my book shelves; I can have two rows on them. Overall I'm really happy with my new organisation, and am actually surprised about the extra space on the bedroom shelves. I think the landing bookcase looks great, and it makes a lot of sense this way as it is directly opposite Alexander's room, and all the books on the unit will ultimately be his one day. I don't see myself reorganising my books for a while to come now! 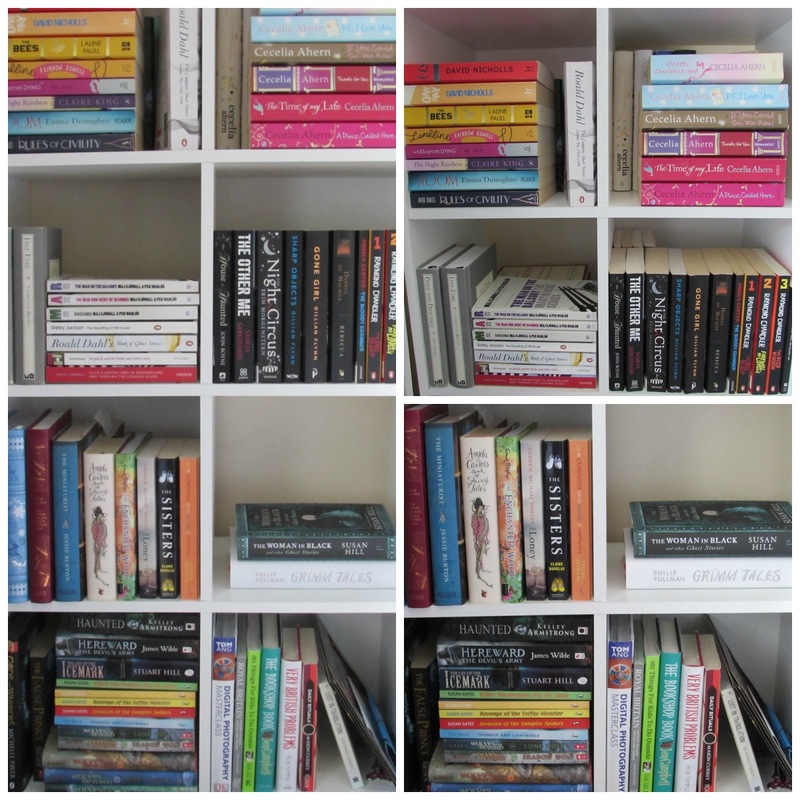 HOW OFTEN DO YOU REORGANISE YOUR SHELVES? I love reorganizing things, too, and haven't done that for my bookshelves for a while. I had giant purges last year....maybe it's time again! Reorganising is always a good time for a little book purge too! Organizing bookshelves is fun! 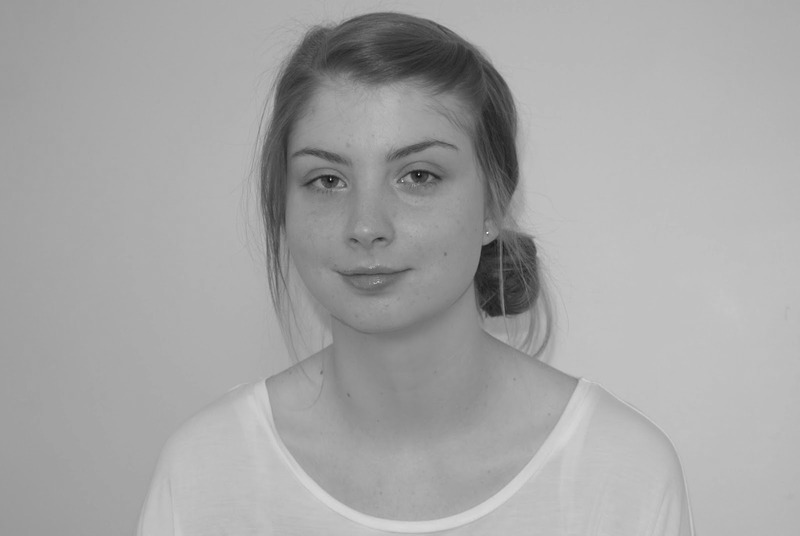 Nice pics- I like how you did things. I haven't organized (or re-organized) in ages, probably should since everything is kinda out of place at the moment! It's fun to see what everyone else does. I've just starte getting into Funko Pops too, they look fun to collect! Thanks! I'm the same as you; I love seeing how others reorganise their shelves! Funko Pops are so cool! I know a lot of people collect them now, and they're a bit of a fad / phase, but I really love them. I like how they look and see myself collecting them for quite some time - these are my first three. Haha - I'm exactly the same, Brandie. Forever reorganising everything in the house. 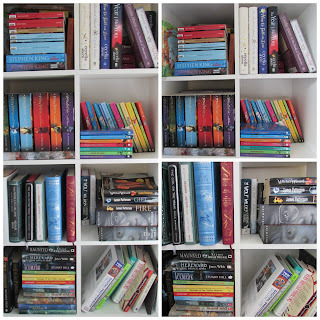 That was a great idea to have a dedicated bookcase for children's/MG/YA! I've tried to do the same, but must admit the "younger" books are starting to overflow their allotted space. The more I think about it, the more I realize that kids books are far more likely to stick around after they are read once. I pass on adult books a lot more often these days and it's changed my buying/borrowing habits - though there is always room for improvement! So some reorganizing may be needed soon at my house! It really makes sense in the long run, especially seen as I buy a lot of MG and YA books for myself, but with the very intention of passing them on to Alexander when he is older. I'm hoping having the dedicated shelf helps us to keep them contained, with no overflow. I also pass on and donate adult books a lot more frequently than those aimed at a younger audience - that's what having children does to you. Haha! If you do reorganise, I'd love to see how!